The 3,000 acre private estate I was hired to help maintain for the summer of 1996 prided itself on being a fly fisherman’s retreat. Lovely Clear Creek flows through Frost Valley and there were several diversions from the stream into lovely little ponds that made perfect trout habitat. Indeed, we did throw in the food. Even though there remained but one fisherman the ponds were maintained like the glory days, entirely overstocked for the food supply, so one of the first chores I learned was where the ponds were and just how many handfulls of pellets to cast upon the waters. The primary fishing pond was a short drive up the valley from the lodge and set on the far side of a mountain meadow. 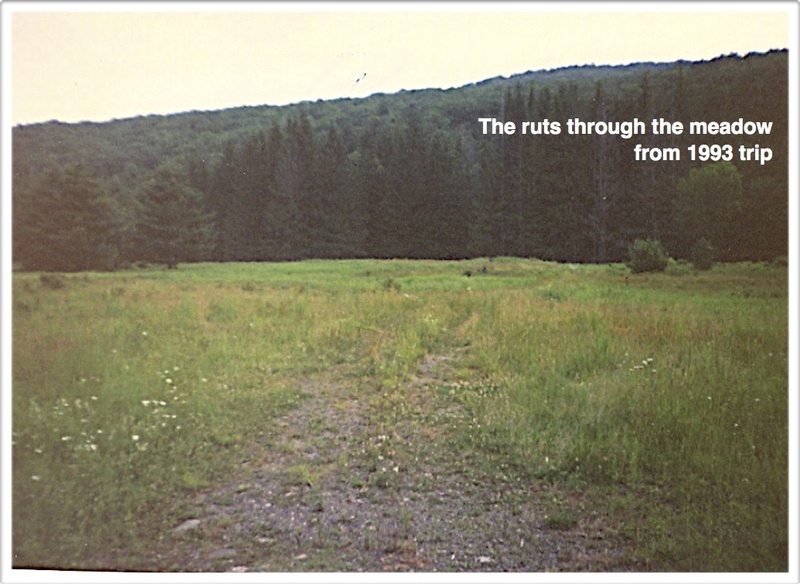 The meadow had a two-rut path of a road arcing to the pond but we never drove on it. We’d just park the Scout by the side of the paved road and carry the bucket of food to the ponds. One lovely spring day (I almost said “One particularly lovely spring day,” but that would imply they were not all lovely. It was always a treat to walk through the ever-changing meadow) I glanced up from my admiring the flowers and grasses to find myself face to face with an undesirable critter. Or should I say ankle to face? Some ten feet away and ambling toward me on the other side of the ruts through the meadow was a baby skunk. We both froze at the same moment. I stood still. After the slightest hesitation, he rather slowly and with great purpose elevated himself up on all four toes and lifted his tail. I’m pretty sure a baby skunk, at lease one big enough to be ambling about on its own, can be just as influential as a full grown skunk and whether that is the truth or not in not something I particularly care to find out. Neither of us moved. Given a minute or so, we both seemed to settle the question of who was out to do what and to whom and we both understood all either of us wanted to do was to continue ambling. I confirmed my intent by making a wide arc through the meadow on my side of the road. He turned on his toes, eyes riveted on this odd creature, until I was back on the path and headed on my way. I turned to see him figure I must be an OK dude before getting off his toes, turning his back, and continuing his journey. I liked that baby skunk. And I hope he liked me. A very cool pole cat, indeed. 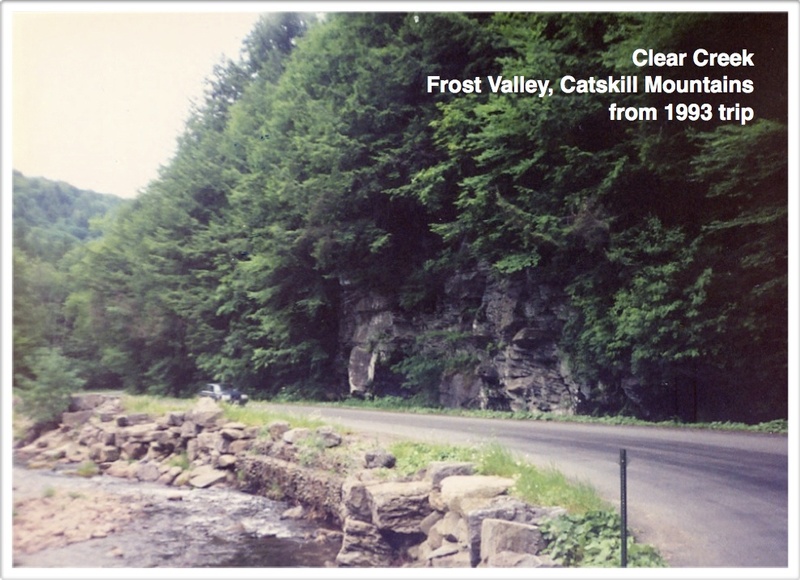 This entry was posted in Hitchhiking, Uncategorized and tagged Catskill Mountains, Clear Creek, fly fishing, Frost Valley, meadow, pole cat, skunk on March 28, 2014 by deansgreatwahoo. Poor baby orphan skunk. I thought you were going to tell me about putting him under your arm taking him along with you. Not good for rides however. Oh Blossom! Wasn’t that the name of the cool skunk in Bambi? Too bad skunks have such a potent defense mechanism. They are incredibly cute. But then again, maybe that’s why they need such a potent defense mechanism.